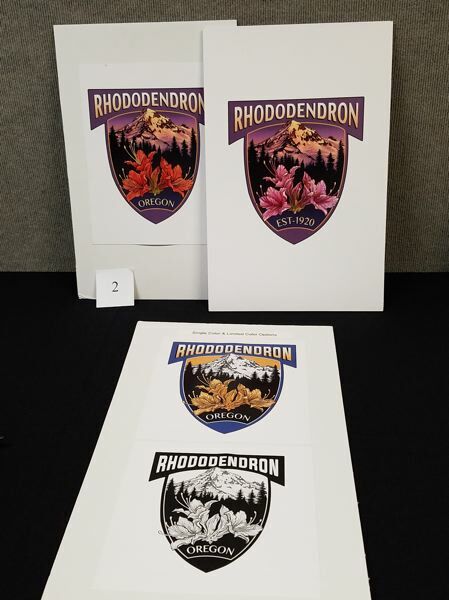 The Rhododendron Community Planning Organization's (CPO) search for a logo is over, and local artist Laurie Crabb is the victor. Her design was voted to represent the mountain community at the CPO meeting in Welches on Saturday, May 19. Crabb is a waitress at the Rendezvous Grill and Tap Room in Welches, and her design is an inclusive badge-style illustration of the Rhododendron flower featured prominently in front of a depiction of Mount Hood. After the initial call for designs, the CPO subcommittee Rhody Rising received 45 different submissions from artists near and far. The attendees of the March CPO meeting then narrowed the submissions down to a collection of six, which was later narrowed down to four. The final four designs were the works of Laurie Crabb, Cheryl Budd, Mark Shumaker and Renee Lamoreaux. The finalists were judged based on popularity, ease of production, cost of reproduction, visual acuity and then the design's total score. "We really appreciated the work everyone did," CPO President Steve Graeper said. Crabb will receive four vouchers to Mt. Hood Adventure Park, a gift certificate for a ski rental at Otto's Ski and Mountain Bike Shop, a gift certificate for 18 holes of golf (with cart) at the Mt. Hood Oregon Resort, formerly known as Resort at the Mountain, and $500 in cash. "(Crabb's logo) represents the area pretty well," Graeper told The Post. "All of (the designs) did. What (Crabb's logo) did was just kind of brought together the community." The CPO will keep the other 44 designs for consideration for future specific projects. The community will be consulted when the CPO moves forward to determine which image should represent the gateway.